This weekend is the first exact alignment of the Uranus-Pluto square. We've been watching this one develop for a long time, both in the culture and as an astrological event. For those individuals born in the 1940s and 1950s, this astrology may be reminiscent of an exciting time in your life -- a time when it seemed possible to change the world. For those born in the 1960s through the mid 1970s, you may be noticing your spirit called to awakening and action like nothing you've ever felt before. 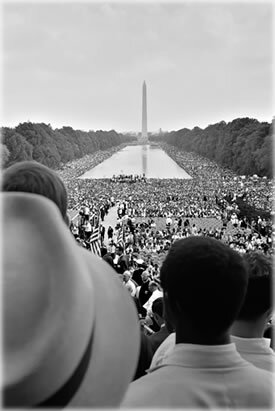 Crowds surrounding the Reflecting Pool, during the 1963 March on Washington. Photo by Warren K. Leffler / Library of Congress. Sometimes I'm concerned that we're giving this Uranus-Pluto aspect too much emphasis, though it's something that's influencing everyone personally to some extent, and many people to a great extent -- especially those who have natal planets in early Aries, Cancer, Libra or Capricorn. These are the cardinal signs, the ones that provoke change and progress. Much like the Saturn-Pluto opposition of 2001-2002 was a setup for the decade to come, the Uranus-Pluto square is truly a sign of the times and is setting the tone for our current era. We live in a transitional phase of history: a time when many problems will come home to roost, and when we will need to be at our most cooperative and inventive. Enlightenment is not a luxury now. It's a form of maturity that will allow us to keep a handle on our lives, and gently guide the human community to a better place. While the qualities of the Uranus-Pluto cycle are well documented, each time it happens there are new surprises. That's another way of saying unexpected events. The Uranus-Pluto square will make seven exact contacts, starting with Sunday's and ending with the square of March 16, 2015. Studying the sequence of these charts, a lot is going to happen between then and now, much of it seeming to happen around us, with plenty of developments seeming to come out of the wild blue. Because we are among a relatively few people on Earth with access to the deeper levels of astrology, we have another gift that Uranus grants: that of foresight. That's one of the properties of Uranus, the faster moving of the two planets involved. It's essential that we apply this power of foresight starting right now, because we need to be able to look ahead and, even in an atmosphere of the unexpected, consider some of the possibilities and how to work with them constructively. Uranus also connects to developments in science and art, which is another way of saying that we can think in new and radical ways under its influence. Taken consciously, life is indeed part science and part art -- with 'consciously' being the operative idea. Yet in Aries, we have some cause for concern, because to access the better nature of this sign (which each of us depends upon in our charts) is going to call for the kind of self-awareness that doesn't grow on trees. Lacking that self-awareness, there can be a kind of militancy or aggression. Uranus is the planet of revolution, and through history, most of those have involved weapons (even when Uranus isn't in Aries). So we need to focus on the other kind of revolution, the one that starts within. This is a matter of personal choice, upon which much depends. There may be a good few situations in your life that boil down to the choice between aggression and awareness, in particular, self-awareness. You could say this is about slowing down a bit and looking where you're going when you turn a corner. Let's consider Pluto in Capricorn, which we've been experiencing since 2008, when the transit began. Capricorn is one of the signs about the past. We humans tend to drag around a ton of material from both our personal past and our ancestral history, without considering the effect that so much dead weight has on our vitality. The revolution starts with you. Photo by Eric Francis. Pluto in Capricorn is about revitalizing the places within us that are stuck somewhere in ancient history, refusing to observe and engage with the present moment as it really is. Being stuck in the past, including the ancestral past (living out the hopes, pain and frustration of our ancestors) is a common condition on the planet. Speaking as an astrology consultant, I can tell you that bringing up the topic of family or parents with a client is often like lancing a boil that never seems to drain. Carrying these dead cells is a serious tax on our energy. Pluto in Capricorn is here to help. Then there are the structural themes of Capricorn. We like to think of it as dependable ground we can stand on, though Capricorn is a cardinal sign. Like the Earth itself, which twists and thrusts and shakes, this deeper nature of Capricorn is being instigated by the unstoppable force of Pluto. Now, put these two forces together: the revolutionary power of Uranus meeting the evolutionary drive of Pluto. Imagine this has been warming up for about three years, that it's going to be exactly aligned for three years, and will have after-effects lasting at least another five years. If you're wondering why so many people are living through desperate times, that's one side effect of so much tension and movement -- and the threat of progress when these two forces -- Uranus and Pluto -- make direct contact. Anyone clinging to the past has a serious problem on their hands, and that could include anyone (not just ExxonMobil executives or crusty old senators). There are lots of ways to describe this tension (for example, the drive for radical progress of Uranus in Aries versus the fear of cataclysmic change described by Pluto in Capricorn). The square 90-degree aspect that we're experiencing has its roots in a conjunction that happened in 1965 and 1966. By that time, there was obviously something going on. The Civil Rights movement was active through much of the 1950s, and the March on Washington that you see illustrated above had happened in 1963. Clearly, there was something in the air, but could anyone have predicted the turns of events over the next 10 years? That's about where we stand today. We know how precariously balanced our lives are, and what a fragile state the world is in. People are actually starting to notice that exceedingly few political 'leaders' and even fewer heads of multinational corporations are involved in solutions to any of the problems they've been so busy creating. Their game is to maintain the status quo, because it works for them, even as the system they've built threatens to crumble under their feet. From the Occupy movement of 2011. Photo by Beth Bagner or Eric. Probably Beth! It has that surreal look, but it's real. We actual humans are being invited to participate in a different experience: that of waking up. One of the first signs of awakening is noticing that you've lived unconsciously in the past, and one of the next is noticing how many people seem to be sleeping. Don't stop there. Awakening is something that you have to do every day, and the continuity of thought and progress that you develop from day to day and year to year and moment to moment is called awareness, or mindfulness. As we go through this, I would propose that we never underestimate the lure of go-back-to-sleep influences. The prescription pills, the mind-numbing work, the corn syrup and the gratuitous violence are still flowing freely. Many people go through lives gradually becoming their parents, pretending to be unaware of that fact. Many people say over and over again that they're going to go for therapy, never receiving the incredible benefits that can offer them. One last trap is awareness going no further than a slight tickle in one's brain and the vague hope that 'things will get better', which can easily be numbed out by the fear that if you dare to make a move, life will get worse. Part of the Uranus-Pluto aspect involves noticing and questioning the role of fear in our lives. That's another way of saying it's time to pluck up some courage. There's a good chance that the Uranus-Pluto square is working directly on your chart. Nearly everyone has some significant planets or other factors right in line with this aspect, which become the focal point of evolution, growth and progress. Learn something about your chart and you can spot the places where you're under the most pressure to make changes. The chances are you know it, too -- and you're getting direct information about what, exactly, needs to change. Yes, it's time to stop being poisoned and voluntarily poisoning ourselves and being ripped off and voting for people who steal from us. It's time to stop passively watching the destruction of the Earth. It's time to stop wishing we 'had a life' and actually get one. And as you know, it's time for a lot more than that. Action is the fruit of knowledge -- and I mean this literally, not as some philosophical metaphor. This week's featured interview from the United Astrology Conference (UAC), brought to you by Planet Waves FM, is a conversation with Nomi Gallo and Simon Chokoisky of The Ayruvedic Institute. Nomi and Simon shed some light on the nuances of bringing Eastern spiritual concepts to the West, noting both differences and universal ideas. They also emphasize the importance of preparing oneself to be healthy in mind, body and spirit, and to be well rounded, as necessary groundwork to becoming an astrology student. It’s an engaging, fun, illuminating conversation embodying the very simplicity of natural logic found in Ayurveda. Our UAC coverage includes well over 20 great interviews with astrologers, psychologists and other spiritual practitioners, and we hope you have fun exploring them. This week on Planet Waves FM: All Hail Northern Solstice! Here is this week's edition of Planet Waves FM, recorded on the eve of the solstice. I cover the Gemini New Moon -- the Moon in the that odd 28+ Gemini (which I covered in the article Here at the Edge of the World). We then take a song break, diving back to the late 20th century -- my guitar teacher, Rusty Boris, made a CD and I play a track called "Thank You." In the second segment, I talk mainly about Saturn opposite Eris -- the seeming dichotomy of independence versus relationship. Here is your program in the old player, where you'll find the full archives and a downloadable zip file. Here is another version of the archives -- organized with program descriptions. We have LOTS of great Planet Waves FM editions planned for this summer -- stay in touch! PS, Note, here is the PDF about Eris that one of our readers mentioned in a comment on our main Daily Astrology and Adventure blog. I'll put it on "free sale" today. I wrote this just about three months after Eris was initially named. Given how swiftly I moved after the naming, I've no doubt it's the first full-strength attempt to delineate Eris, and it may still be. I'm curious to see how it checks out against your experience. If you do a Google search with my name, the word Eris and the word astrology, you will pick up dozens of other references over the years. Or, if you prefer, here is a compilation on Eris that includes some of my best work on the topic. We'll be sending this out by email too. Aries (March 20-April 19) -- You're about to experience what you can think of as a progress-check on your journey to wellness. You've been through a long phase of reflection, many experiences of learning how to change your mind, and gradually devoting yourself to healing. Yet it seems like the real demonstration of your progress is going to come through your relationships in the coming weeks. Part of what you've been working through is how to handle anger and aggression. Along the way you may have noticed what a big problem this is for so many people these days. Where you stand today is at the point of connecting theory to practice. You've studied the map, you've studied yourself; now as Mars moves out of Virgo and into your opposite sign Libra, you get to dive into the territory. This includes how you handle your own Mars-related emotions (desire, anger, aggression, fear) and how you handle those feelings in partners. You will need to notice carefully when you go into reaction mode, as opposed to response mode; it's essential that you be able to distinguish whose feelings are whose; it will not always be easy. Most significantly, you become the guardian of fairness and balance, and this will necessarily involve situations wherein you're the judge of your own cause. On one level I could describe the aspect structure of the next month as an experiment in integrity, which is to say, both inner wholeness and the question of what your relationships reflect about your state of mind. Taurus (April 19-May 20) -- Self-esteem is the core issue for you now, though culturally we have so many problems with this topic that it's like trying to describe air. By all rights, you should be feeling great about yourself these days, though inside that feeling there appears to be a deeper question. It might help to think in terms of ‘as if'. Faced with any decision or circumstance, how would you respond if you valued yourself more? By that, I don't mean responding to your fear -- I mean your actual affirmative value on yourself, which extends into your environment and your community, since you're so deeply dependent on your surroundings for your happiness. Your charts suggest there's something you may be struggling to let go of, and to the extent you're stressed at all, consider this. When self-worth is compromised, people tend to compensate other ways. Some do this by getting rich or famous. Some exert their power over others, or by fostering an obsession with physical strength. Some substitute the need for public adulation as a substitute for being loved by their parents. I suggest that you be vigilant about when any form of behavior is designed to make up for a perceived loss or lack. If you pay attention you will notice when this is happening, and you may also get the hint that it won't work. No substitute for authentic self-value will ever work. So forget the substitutes and go for the real thing. It's right within reach, and you'll know it when you feel it. Gemini (May 20-June 21) -- You may have been getting the message in recent weeks how crucial it is that you be honest with yourself -- and various reminders of how easy it is to be less than honest. It's not too late, and yet moving forward, it's essential that you be scrupulous in your self-assessment and your dealings with others. Dishonesty is not always about telling outright lies. It also includes concealing your motives and intentions. It can slip in through being idealistic, exaggerating or denying certain facts. One thing that will help you is to consider your sense of proportion before you speak or take action. How important is something, really? How important is it that you get your way? In addition, Jupiter in your sign is offering you depth and wisdom, but its square aspect to Neptune cautions that you could dismiss what you know because you consider it inconvenient. This is another way of saying, don't let your idealism get in the way of perceiving the truth of any situation. Rather, get under the surface and be honest about your motives -- something that has not been easy for you lately. As the month develops, you could find yourself involved with a crusade of some kind, or at least, a crusading attitude. And if that turns out to be true, you'll want your moment of commitment to be based on something authentic. Doing this well is first a matter of practice, then of preference. I suggest you start with the commitment to being all real, all the time. Cancer (June 21-July 22) -- You are starting to feel what's missing, because it's not so missing anymore. It's as if you're remembering your own presence among so many events and activities that surround you, though your awareness may occasionally drop below the surface before bobbing back up. When this happens, I suggest you ask yourself if you're trying to deny the intensity of your own life, or your need for deep commitment to handle the many demands on your growth. One of them seems to be about playing a central role in the emotional cohesion of your family or circle of friends. I suggest you listen carefully to what children have to say, and keep your mind on their wellbeing -- even if they're not your own kids. See if you can remember your own observations about the world when you were much younger. There are things that didn't make sense to you then, which still don't make any sense to you today. What if you refused to pretend that they do? The things you held dear when you were much younger, such as the concept of 'life' itself, and your corresponding respect for existence, can be of significant help to you and the people around you. Nearly all of the problems the world faces emerge from the refusal to have even the most basic respect for life. You will be a lot happier if you don't play this game, and you will set the example that it's possible to focus on what really matters. Hello Cancer -- Eric has written a new description for your sign that you have access to from this link (no password needed). 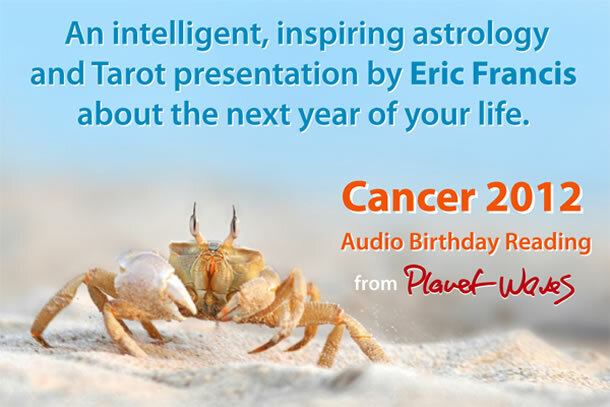 Your Cancer birthday reading is almost ready. It will include more than hour of astrology plus a tarot reading. Check your email later today or early tomorrow for access. Leo (July 22-Aug. 23) -- Give up any desire to control how people perceive you and it'll be easier for you and everyone else to see you for who you are. Though you may have your doubts lately, the thing that your friends value the most about you is your sincerity. This quality about you will work with an almost mystical power through July and into the next year of your life. The thing to remember, and the thing so often forgotten, is that all you can really be is yourself, so you may as well do that exclusively. The example you set is one of the most likely to be followed; you have the privilege this year of being a kind of trendsetter, though it's best not to think in those terms. Rather, remember the wisdom of A Course in Miracles, which reminds us that "everyone teaches, and teaches all the time." If you've ever noticed that people tend to do a lot of imitating of others, it's time to take that to heart. While words are a vital part of this process -- especially over the next few weeks, with Mercury making an extended visit to your sign, what counts the most are actions. If you do use words, remember to use them wisely; there is a pattern developing where you may regret what you say, and have to correct yourself. That alone sets a good example, as so few people can admit that they were wrong, though it's preferable to get it right the first time. We will soon figure out that it's actually 2012. The recent retrogrades of Mars and Mercury seemed to create a delay, but really this winter and early spring has been a phase of gestation. Over the next four weeks, the energy starts to pick up pace dramatically, and we will discover where we are and that something unusual, and beautiful, is happening. Even as we approach the truly beautiful potential of the astrology that's developing, many people are struggling with their day-to-day lives. There are more questions than answers; the economic and political situations seem hopeless; the pace of existence is going so fast that there seems to be nowhere to get in a little meaning, or seek some peace of mind. 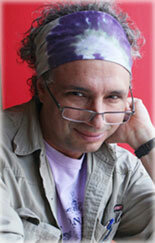 Here is where astrology can help. Astrology looks at the longer cycles, and the deeper themes -- and can help you see your life in context of the present moment, no matter how chaotic it may be. Context means a sense of where you fit in that will help you see your potential and make better choices. 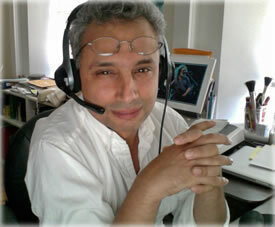 For years, I've been helping my clients prepare for making the most of the astrology of the 2012 era. Based on this experience, and many years of study, I've prepared a set of readings for all 12 signs (and rising signs, and Moon signs) that guides you through this astrology, step by step. I cover the most challenging and energized developments of this spring, which includes eclipses, Venus retrograde, the Venus transit of the Sun, and then a few days after the Sun ingresses Cancer, the Uranus-Pluto square. Each sign gets a half-hour discussion. These came through loud and clear, with strength and meaning. I spent a week designing and recording them, and I am grateful to be able to offer them to you as a tool to help you guide your decisions, as you seek deeper meaning along your journey. 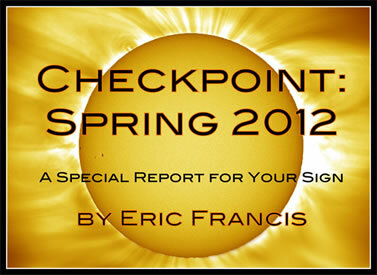 Spring 2012 is a kind of checkpoint along the way to wherever you are going. But really it's a calling into the adventure of existence, a bold invitation to go beyond your past limits and explore something truly new about yourself. Signs are now available individually for an amazingly low price, cheaper than the paper shopping bag costs at Jimmy Choo -- order your reading here. The report is getting rave reviews from people who are currently working with it, including these words from a customer named Donna: "OMG -- thank you thank you thank you -- just spent this morning listening to my [Spring Report] info, and am so blown away by the accuracy (and relief!) in this experience. 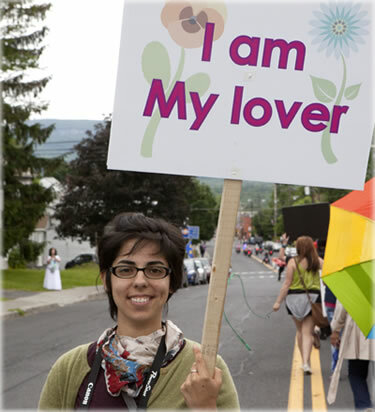 Thanks so very much for your part in supporting this work and for showing up in the way that you do!". Here is the link to order. Please drop us a note if you have any questions. Virgo (Aug. 23-Sep. 22) -- Mars has been in your birth sign since November, and on July 3 it heads for Libra. A review of this momentous transit is in order. Mars carries a rather different energy than Virgo, though the two are an essential combination. The point of this transit has been to teach you how to assert yourself. To do this, it helps to get clear with yourself and be coming from a unified position within your own consciousness. If you're not in conflict with yourself, it's a lot easier to stand up to the world. This transit has provided you with the opportunity to work out any misunderstandings with yourself that you've been carrying around. Next, when Mars is present in such a distinct way, it's necessary to learn how to direct your will and your intention. Mars is a sharp object, and it has to be handled with both mental and physical precision; that is the role of Virgo. In sum, this transit has provided you with the kinds of benefits that a teenager gets from taking a martial arts class. Remember what you've learned during the past eight months of your life, because they are indeed valuable, once-in-a-lifetime lessons. Now with Mars moving into your 2nd solar house, you get to direct your will and intent into the management of your resources, including money. Mostly this will amount to an extended exploration (and use) of the concept of balance -- the single most important skill when it comes to wise management of resources. Libra (Sep. 22-Oct. 23) -- You've been learning a lot about fear the past few months -- and soon the topic switches to faith. Fear tends to live in a self-contained world. That world follows its own rules and has its own internal logic, which is self-serving and, as it turns out, self-defeating for you. I suggest you make a list of everything you've worried about since late autumn and then note how much has actually come to pass. Fear is largely a creature of the imagination, of misdirected creativity. Faith works differently. It opens you up to a world beyond yourself. It is a power that comes through you. Apart from any difference in the subject matter, the energy flow is worth observing, because it's a useful way to figure out what you're actually feeling. Simply, stuck is of the nature of fear and moving is of the nature of faith. This idea is in harmony with something that Joe Trusso, one of my teachers, once said: the opposite of depression is expression. The next few months are all about you expressing yourself in a bold way. Per the characteristic of faith, that expression can have the sensation of something flowing through you. That something is ‘beyond yourself' yet still distinctly recognizable as yourself. Among the seeming paradoxes we face in life, this is one of the most pleasant. We don't often think of that thing beyond ourselves as part of us, though for sure this experience will help you recreate your understanding of who you are. Scorpio (Oct. 23-Nov. 22) -- The child in you is a revolutionary. I don't mean a rebel -- I mean someone with an agenda to set the world right. The challenge you have is to embrace the potential for change, healing and liberation with the youngest part of yourself, while at the same time bringing in the focus and maturity that is your prerogative as an adult. To this end, I suggest that you do a few things. One is to pace yourself. Yes, time is of the essence, and getting ahead of yourself is a good way to waste time. Take things in order, one at a time. Next, remember that while there may be revolution in the air, at least half of that equation is evolution; and this is a process of trial and error. Yet it can take vast leaps even when contained in an environment of orderly progress. Keep in mind that the unstoppable evolutionary force is in the sign that's associated with how you think. So for you, as a revolutionary, the core theme is understanding your thought process, specifically for making corrections to what you can think of as your mental genetic code. Like any strand of DNA, this is based on ancient information -- though you are clearly aware of the pressing need to bring this up to date. Your goal is to make sure that your thought process is current and not something akin to that of your ancestors who were roaming around the planet in 1895. Sagittarius (Nov. 22-Dec. 22) -- Relationships are said in many spiritual and therapy traditions to be a mirror. This is good in theory; somehow we all know it's true. In practice, though, it's easy to forget, and challenging to apply in a pragmatic way. Now would be the time, however. The first thing to remember about mirrors is that unlike a photograph, they present an image that is reversed horizontally. Plus, every mirror is a little different; at a certain point you choose the one you like the best. One particular mirror in your life is showing you the past. You can peer right into your own history, and make a decision about whether you resemble that person at all. Other mirrors represent your potential, and show you how much beauty and wisdom you've got available. The thing about those reflections is that you might not believe them. In fact, you're more likely to believe the image that shows you who you were, since you're more accustomed to it. I suggest you gradually cultivate your relationship to what you think is unrealistically positive. As you do this, you may notice certain emotional zones where you feel like you may be injured or fall short of who you want to be. As part of making peace with your potential, you get the opportunity to heal those parts of you that you might have decided are unworthy of love. This is a bold place to be; in a sense you're confronting one of the deepest insecurities that people are capable of. It's about time, too. Capricorn (Dec. 22-Jan. 20) -- You are poised to take charge, though I suggest you work with a strategy. Step one involves something called power analysis. This is a conscious dissection of your goals (and figuring out what they are and why you have them); of who in the situation has influence over whom; and of your actual leverage in the situation. You need to place having a clear strategy above your tendency to react or respond emotionally, no matter how strongly you may feel about the situation. You've spent a long time analyzing the ethics involved, and examining your own psychological tendencies. Now that it's time for action, I suggest you remember one thing. The scales of justice can be tipped one way or the other by a single gram. It is therefore vital that you use your influence wisely, and with precision. If you proceed in a reserved, understated way, you will gain the respect of others -- particularly if you spend time listening. This process will also build trust. There will be many developments over the next month that seem to take on a life of their own -- though I assure you that they're reasonably predictable -- and much more flexible than you might imagine, in case you want to sway things in another direction. The thing to remember is that exerting less influence is better than overdoing things. You want to be respected, not feared. And these days, fortune favors those who are capable of changing their mind -- which is another way of saying capable of growing. Aquarius (Jan. 20-Feb. 19) -- You tend to need a lot of reassurance before you take any kind of risk -- and you have that now. Yet even if external validation is available, I suggest you emphasize what's coming from within, because you are the person you're most likely to listen to. Most of the time we think of achievement as something we reach for. It's ‘up there', away from us. The sensation of your charts is gently stretching your capacities from within. Think of it as being a bigger person, rather than a better one. Imagine that you encompass more possibilities, and that you're friends with a diversity of potential outcomes, rather than being attached to any one. Contrary to popular folklore, Aquarius is one of the more conservative signs of the 12. This raises the question of your relationship to fear. You don't really believe the worst-case outcome is the one that's going to happen -- though why do you so often conduct yourself as if you do? Now, life is encouraging you to take some chances of a sort that you have not experimented with in a long time. Yet you do have experience with stretching yourself in this way. You may feel like you need extra courage to account for the extra risk involved, though I would say that curiosity will serve you better. In its most valuable form, this would be curiosity about yourself -- which will serve you many ways. Pisces (Feb. 19-March 20) -- You're looking right at the tendency in your relationships that you've wanted to work out very nearly forever. You now have the power of awareness not only to avoid making the same mistakes again, but better still, the courage to be free from fear if you do. Ultimately every relationship involves embarking on the unknown. At some point we have to decide that someone we care about really is being honest, and this is a feat that has its deepest roots in your ability to trust yourself. If you use what your senses and your intuition tell you, then you'll be able to make clear decisions. I suggest you set a limit on the extent of using your past errors as a teaching device. You definitely need to understand where you've been, but more significantly you need to use your creativity to do something different. That's to say, you cannot go forward merely by avoidance -- you go forward by visioning what you want, setting a destination and then setting out in that direction. While you're unlikely to arrive exactly where you planned to go, there's a good chance you'll end up someplace better, with unexpected rewards that come as a direct result of your willingness to take a chance and explore unfamiliar regions of yourself. One of the most exciting things about your chart is the strength of your inner presence. It's as if a world is opening up within you, which will manifest first in your awareness, then in your home space, then in your immediate surroundings. Enjoy the trip.